“Captain Phillips” (Tom Hanks) was the commander of cargo ship MV Maersk Alabama which was seized by four young pirates some 241 miles southeast of a Somali port city on April 9th, 2009. 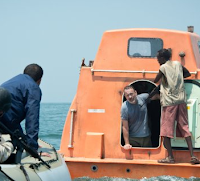 Based on the book A Captain's Duty: Somali Pirates, Navy SEALS, and Dangerous Days at Sea, Captain Phillips is the movie of just what happened after at first evading the desperate band, only to later be boarded by the four young men who were finally able to threaten the ship and lives of the crew. With the crew hidden and Phillips taken hostage, the US Navy gets involved, and then the Navy Seals as the international incident that made so many headlines erupts to become a fine example of the US Armed Forces at their best. And that was the intent as far as it is portrayed here in the movie, but the movie itself did not go quite as well as the real-life operation. Greengrass, the esteemed director of the riveting United 93, with its unbearable tension and edge-of-your-seat adrenaline building, brings the same formula to work for him here. The problem is, the content isn’t of the same nature and required a lot better timing and much better (and more consistent) character development to make work. 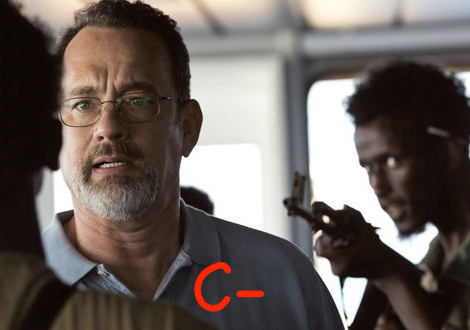 I’m sorry to say that Captain Phillips is no United 93. Hanks’ Phillips needed a lot more work as well. His put-on accent doesn’t really stay with him as the movie progresses. His mannerisms seem unnatural and the way he paces through his stiff and rather uninteresting character makes him forgettable since we continue to be reminded that he is simply acting. When the film opens, we are given a rundown of Phillips’ personal troubles at home as he drives to the airport for the trip, his wife sitting next to him. But right up until the time the threat of a hijacking becomes eminent, we aren’t made to care or relate to anyone. We do not even know how to expect people to act on screen the next time they appear because no one is able to establish a pattern to their characters. When the hijacking occurs, things don’t get much better, thanks to improperly utilized pacing. It just doesn’t work for this movie. It isn’t until the last 25 minutes of the film that we get to see Hanks lay down some of the finest acting of his career. Yes, the finest, but that still doesn’t allow it to pass. 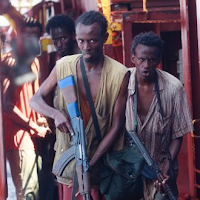 Barkhad Abdi as “Abduwali Muse,” the young and ambitious pirate leader, comes mighty close to making a lasting impression on audiences, but alas, fails to deliver the needed pathos to get us to fully sympathize with him and his band’s plight. The longer we watch, this becomes more evident as we just don’t find ourselves feeling for him (through no fault of the actor). Careful control of the cameras and the details sought for a “real” looking effect in the escape pod (where much of the movie takes place) doesn’t help spread out the tedium of a story that, quite frankly, needed a big reboot, especially with regards to how its characters would interact and what segments of the drama audiences would see. Phillips would later go on to sue Maersk Alabama for insufficient training, as have also other crew members. In all honesty, you may be better off watching the Military Channel’s documentary on the events of the movie instead of bearing with this problematic piece that, despite much critical praise, doesn’t even manage to capture the raw patriotism it wanted to or the efforts of the Seals who pulled the trigger at the critical time—they are not so much as shown on camera for longer than a few glimpses.